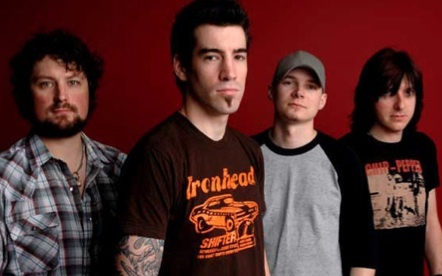 On November 29th, 2008, we had the chance to sit down and call Dean Back of Theory of a Deadman. We covered where the band came from, where they are now, and where they want to be in the future…all from the fall out of Scars & Souvenirs. RockTrib: How did the band get their start? Dean: We grew up together and started jamming together in the basement of Tyler’s parents place. Tyler’s dad was a musician as well, and he had a little studio set up and we would write songs and record them. We did a little demo, and we were friends with people who were friends with friends of Chad Kroeger of Nickleback. Tyler was at some party where Chad was also at, and he gave Chad the demo. This was right before Nickleback was to become big. They had already had a record deal in America and Chad was already thinking of starting his own record company. When he heard our stuff he was impressed and signed us to his record company in Canada, and then we signed onto Roadrunner Records in America. RockTrib: How did the name Theory of a Deadman come about? Dean: That was a song title off of our first record, now titled “The Last Song”, and when we were recording the song for the record the title had changed and the song kind of changed as well, and we did not have a band name when the record company had signed us. So it was just one of those things where this phrase kept sticking out to us, so we took it for a band name. RockTrib: How did it feel to go from making music in Tyler’s parent’s basement to all of the sudden, one day working with the likes of Nickelback and touring with major acts like Shinedown and the upcoming shows with Motley Crue? Dean: Well it didn’t happen over night…I think when we were a new band, one of the good things we had going for us was we were always writing and always jamming. We never rushed right out into performing on stage; we really concentrated on writing strong songs and really working on our craft rather than any kind of live show. So when it was finally time for us to take the stage, we were confident in our stuff. This is how we grew as performers and when it was finally time for us to take the stage we just had a blast with it, and anyone who has ever been to a Theory of a Deadman show will say that our show is full of energy. RockTrib: Looking at the tour dates, you guys are booked for the next few months solid. How do you manage being away from your home life for so long? Dean: Its tough man…but its one of those things that comes with the job. We have adapted to it, and it’s become a part of our life. We’ll be home for the holidays. We try not to go out anymore than a month and a half or two months before we get to go home. But yeah, it’s tough. Luckily we all have a lot of support back home, and we all have great girlfriends and wives that truly understand what the sacrifices in the business are and it’s this great support system back home that makes it easier for us to be here. RockTrib: How do you compare your new album “Scars & Souvenirs” to your first two albums? Dean: I think since the first record we have really grown as a band and the songwriting has become stronger and stronger. I just think this new record just felt really good and natural when we started recording it. It feels good because we have always wanted to be one of those bands that have lasted and be around for a long time. We have seen a lot of bands come and go, blow up and then fizzle away. Just to know that our band has grown and slowly gotten stronger and stronger makes us extremely optimistic as to what the future holds for us. RockTrib: Where do you guys get a hold of all these beautiful women for your videos? Dean: *laughs* Bad Girlfriend was shot in Vancouver and I might be a bit biased because I am from there, but they have some of the most beautiful women in the world there. RockTrib: You guys have toured with the likes of Breaking Benjamin, Shinedown, and the upcoming shows with Motley Crue. Who is the one artist that you as an individual was the most excited to play with? Dean: Our band is the children of the Grunge era, and we all grew up listening to those types of bands. Recently we got to play a few shows with the recently reunited Stone Temple Pilots. That was unbelievable. It was great to see those guys playing again. My favorite band of all time was Guns and Roses. If those guys could ever put their troubles behind them and join forces again that would be ridiculously awesome for me just to even see. And another band is Alice in Chains. Even though Lane (Staley) is gone, their new singer is great. He does a really good job and we got to play a few shows with them. RockTrib: How would you describe “Scars & Souvenirs” from beginning to end? Dean: I think it’s just a good description of what we are all about. We were really able to have a little more freedom and release songs that really describe who we are. Songs like Bad Girlfriend and I Hate My Life…there’s a lot of tongue in cheek, a lot of sense of humor in those songs which we haven’t done in the past. RockTrib: You run the Gamut of emotions with the song names. You have one song called So Happy while another is called I Hate My Life. Where did all these emotions come from? Dean: When Tyler is writing the Lyrics, it’s really whatever he’s feeling at that time is what the song turns into. Like anybody, he has his ups and downs. RockTrib: What should someone who has never seen a Theory of a Deadman show expect when coming to one of your shows? Dean: It’s a good rock show. We have a lot of energy; we pour it all out on stage and by the end of the night we’re drained. And ever since the song Bad Girlfriend came out, it has become more of a prettier audience *laughs*. A lot of good looking girls are showing up. RockTrib: You guys are booked solid through March of ’09. Does it ever become draining putting out that much energy night after night? Dean: The day to day grind, the getting up and doing the sound check’s and stuff, that gets tiresome. But as soon as you walk out on that stage and hear the crowd, there’s nothing like it. There’s no better feeling and I wouldn’t give it up for anything. RockTrib: What song’s do your fans respond to most? Dean: It all depends on where we are, depending on what the radio stations are playing in that area. When we hit the road the fans were really cheering for Bad Girlfriend and I Hate My Life. And these were songs that we really didn’t think of as singles, but the fans were cheering for them really before the record was released actually. We had posted these songs on our MySpace, and so they got to hear them early and it showed because once Bad Girlfriend was released to the radio it immediately did really well for us. RockTrib: What size of crowds are you playing for right now? Dean: Currently we are playing for roughly 1000 people a show, and when we get up into Canada we will play at the larger Theater’s, probably 2000 to 3000 seater’s. RockTrib: Which do you like more, the smaller more intimate venue or the larger arena? Dean: It’s been awhile since we’ve done the big arena thing, so that’s going to be exciting. It’s fun to put the big production together and put on a big show. But then again there’s nothing like playing in a smoky bar as well. They both have there up’s and down’s. RockTrib: Can you give us a quick rundown of your daily routine when you have a big show coming up? Dean: Like today, we woke up around noon and went and got a bite to eat somewhere, had sound check, and then had a sound check party after that with the radio station. They brought a bunch of fans. Then we have interviews like this during the day and talk to different media outlets throughout the day, and then another radio station party tonight. Then the opening act starts warming the crowd up and we will usually sneak in and catch a few songs here and there, all the while the NHL Hockey package is on the Satellite in the bus. RockTrib: What do you want to tell your fans out there? Dean: I just want to say thank you for sticking with us, it’s been a long ride going on 7 years now. If you’re a new Theory fan, come check us out and come to the show. We always make sure that everyone is having a good time. We just want to say a Big Thank you really. RockTrib: You guys have been going 7 years strong, where do you see yourselves in the next 7 years? Dean: Still touring this album…maybe Bad Girlfriend will be played more and we will be touring off of this album still… *Laughs* but we will probably be a few more albums deep and still on the road playing for our fans. Theory of a Deadman is currently touring to promote their new cd “Scars & Souvenirs,” which is in stores now.